The St Patrick’s Day exodus will see ministers travel to 35 countries in one of the largest overseas offensives ever, Independent.ie can reveal. Tánaiste Simon Coveney and Finance Minister Paschal Donohoe are among the big names to land long haul flights. Mr Coveney, who is also Foreign Affairs Ministers, will travel to China and Hong Kong, while Mr Donohoe is off to Argentina. Taoiseach Leo Varadkar will make the traditional trip to the United States for a meeting with President Donald Trump at the White House. Rural Affairs Minister Michael Ring, Diaspora Minister Ciaran Cannon, Equality Minister David Stanton and Tourism Minister Brendan Griffin will also visit various parts of the US. 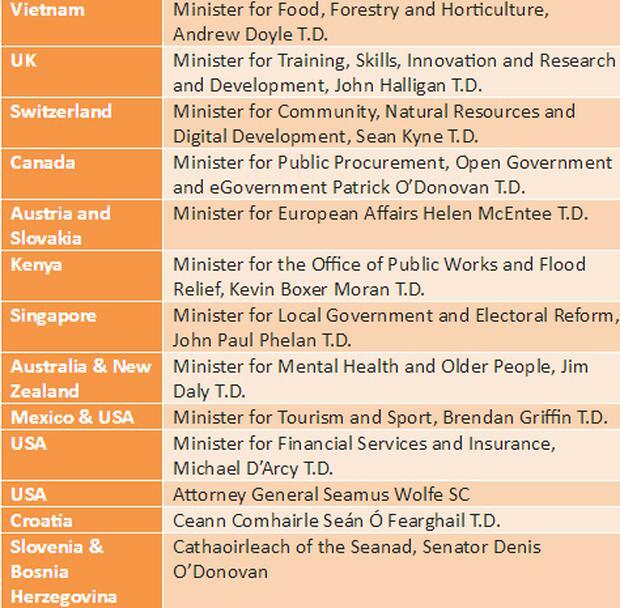 Ministers were told of their destinations at today’s Cabinet meeting by Mr Coveney’s whose department is in charge of the project. Justice Minister Charlie Flanagan is travelling to Australia, as is Minister for Older People Jim Daly. For the second year in a row Independent Alliance Minister Shane Ross is to stay at home. Other high-fliers include Denis Naughten (Canada), Eoghan Murphy (Korea and Japan), Joe McHugh (Brazil) and Mary Mitchell O’Connor (UAE and Oman). 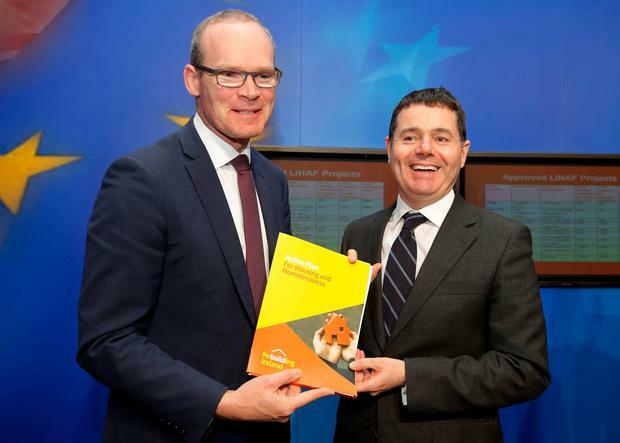 A source told Independent.ie the programme will be called “Promote Ireland”. “The visits have a strong focus on Brexit with many senior ministers at major European capitals,” they said. 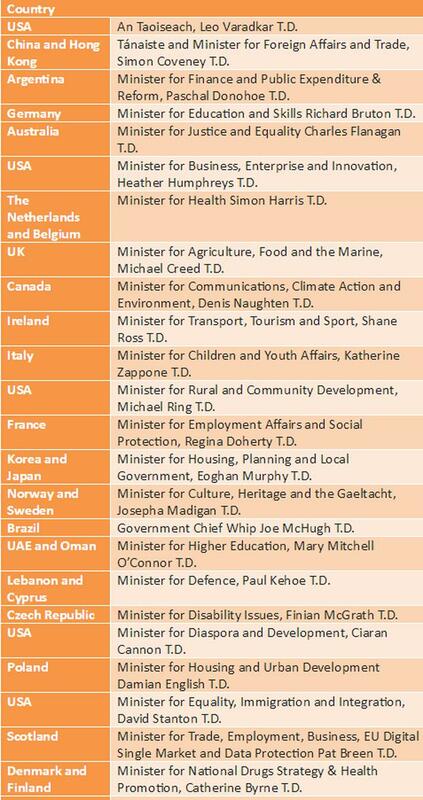 Government Chief Whip Joe McHugh will travel to Brazil, Minister of Culture, Heritage and the Gaeltacht, Josepha Madigan, will visit Norway and Sweden while Minister for Health Simon Harris is set to travel to the Netherlands and Belgium. “The St. Patrick’s Day period provides a unique opportunity to promote Ireland on the international stage, and to renew the strong bonds between Ireland, the global Irish abroad, and our partners around the world. “This year, the Taoiseach, Tánaiste, Ministers and Ministers of State, and Chief Whip will undertake comprehensive programmes across countries in Europe, the Americas, the Pacific, Africa and the Middle East, in a truly global celebration of Ireland. The Ceann Comhairle and Cathaoirleach of the Seanad will also participate in this year’s “Promoting Ireland” programme. “St. Patrick’s Day provides Ireland with an unparalleled opportunity to promote our political and economic interests abroad, as well as access to key political and business contacts in leading markets around world. “This year’s St. Patrick’s Day programme will serve as a platform to launch the Global Footprint initiative as announced by the Taoiseach last August. This will include high-level goals to double Ireland’s influence and impact to 2025 in terms of promoting our values and our interests, including our economic interests. The initiative will reinforce Ireland’s economic progress, and promote Ireland as a leading centre of science and technology, R&D and international financial services, creativity, a competitive location for sourcing goods and investing, and an attractive destination for tourism and study. It will also emphasise Ireland’s ambitious approach to international relations, and role as a global citizen. “St. Patrick’s Day will likewise be an opportunity to reinforce key messages on Brexit, Northern Ireland, Ireland’s campaign to become a member of the UN Security Council in 2021-22and the Irish economy. Outreach by Ministers during this year’s programme will help build strategic alliances in the context of Phase II of Brexit and, looking forward, a post-Brexit European Union.